Allahumma Swalli Ala Sayyidina Muhammadin wa Ala Aali Sayyidina Muhammadin wa Sallim..
Haqq, Hasbuna Allahu wa Ni’mal Wakeel, La Hawla wa La Quwwata illa Billah Al Aliy Al Azim..
Radina Billahi Rabban wa Bil islami Deenan wa Sayyidina Muhammadin (Swalla Allahu Ta’ala alaihi wa Sallam) Nabiyan wa Rasoolan ……Shaykh Abdullah Al Dagestani (Q.S) as our Shaykh and master.Allahu Allahu Allahu Haqq. Allahumma Thabbit’hum alal Haqq, Allahumma Thabbit’hum alal Haqq..Allahumma Thabbit’na alal Haqq Bi Jahi Man anzalt alaihi Surat Al Fatiha..ameen. Grand Shaykh, Grand Shaykh, Shaykh Abdullah (Q.S), when he was living, he said to me, that “Shaykh Nazim,I am seeing dream,I am dreaming last night,I am standing and looking and you also looking. In front of me passing young soldiers.Young people. But, they are all, when coming making salam to our grand Shaykh. And he wa saying to me, this young people they are Russian young generation. They should be all of them,the new ones, coming under the flag of Mahdi (A.S). They should be all of them coming to Islam. Tsar/emperor coming now to Russia. Sultan coming to your countries. In Uzbekistan,in Kurdistan, Kazakhstan, Bash-Kurdistan coming Khans. Sultan coming to Istanbul. German coming Kaiser. France coming king for them. Italian coming. All these people, that they are making so many dirty things, all of them going and changing whole world,a new world. No more dirtiness,finish! I hope that today, very holy, holy day today!. And Allah Almighty always sending His Divinely people with Divinely powers to change everything on earth. Therefore I am looking to him, he is one of them. All Russian, new generation going to be under the flag of the seal of Prophets It is a ..what saying?. Big …good tidings! good tidings! Your country, Argentina, should be there a king also. Tsar,… from East to West, flag of heavens. Flag of the seal of Prophets, flag of our Master Sayyidina Muhammad (alaihiswalathu wa salam). Going to be everywhere. Pray for me also to reach that holy days, holy people. If they not holy they should be taken away!. Guest: As you ask , as you told before. Mawlana Shaykh: So many people going away , bad people going away!. Good ones going to be with Mahdi (A.S) and Jesus Christ (A.S). I am weak one, weakest one.So powerful Saints from East to West. Today, they are on power. What happened on earth from dirtiness from those tyrants going away., going away,going away…and coming. Heavenly ones…Heavenly ones. I hope that , who is sending you to me here I am putting my seal on everyone!.And you should be with Mahdi (A.S) and Jesus Christ (A.S) Isa (Alaihi Salam). 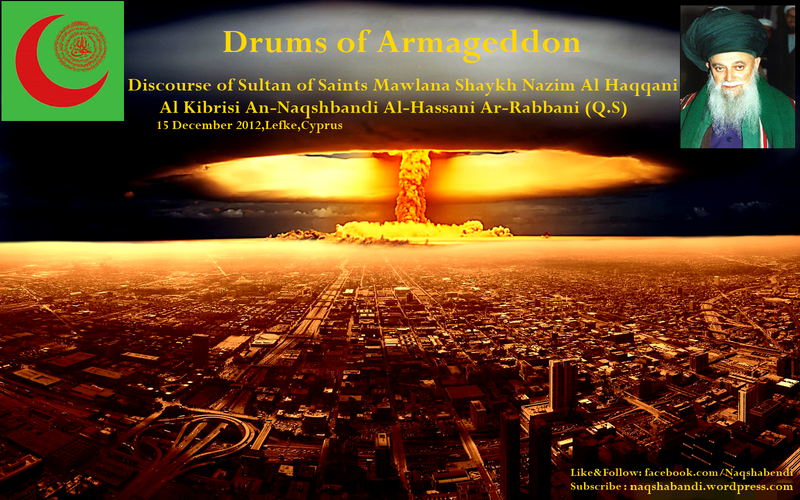 ….if Fitna (corruption/mischief) spread all over the world, the safety is in Damascus. And these days are the days of Fitnah. .From East to West, from North to South, Fitna/corruption is everywhere. Fitna, people…..people ..People are following Satan and they are leaving the Prophets, especially the Prophet of the End of Times (Nabi Muhammad alaihiswalathu wa salam). “whoever turn away from My remembrance (Zikr Allah) verily for him is a life of hardship” (20:124). The Name of our beloved Prophet (alaihiswalathu wa salam) is Sadiq Al Masduq, right? the truthful and Supported by the Truth. What did the Prophet (alaihiswalathu wa salam) say? From the prophecies, prophecies from about the events that will happen in the end of times. What will happen, he spoke, warned and declared. Prophet (alaihiswalathu wa salam) is Al Sadiq al Masduq, the Truthful and supported by the Truth. What he said must happen and he is truthful, any news he gave the news must happen about the conditions of Judgement Day. 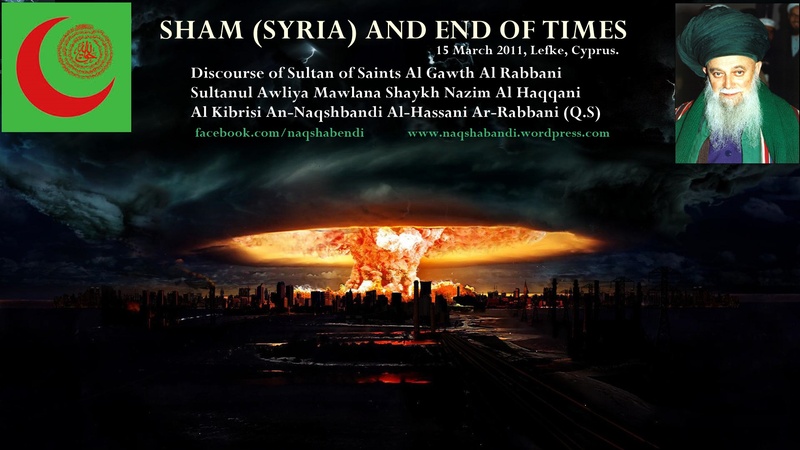 Judgement day/Yawm Al Qiyama is very near. It became very near. And amongst those conditions and event that must take place before Qiyamat (Doomsday) is Armageddon/Al Malhamathul Kubra (the biggest war). It will not leave on the face of the earth from the people except out of five only one will remain , and four will go away,die,disappear. Only will remain one fifth of the people. And this will be much heavier and much more strenuous than the flood of Prophet Nuh (Noah alaihissalam), much greater than the flood of Prophet Nuh alaihissalam. And this must happen, before Judgement Day comes. It is from the signs of Judgement Day people must die, not by thousands, or millions of people,no.by billions billions billions of people must die. There are two angels in Heaven calling, both of them calling every day, to the people on earth and they are saying: “Zidu lil Mawth, wa Ibnu lil Kharab”/increase for death and built for destruction, everyday there is this warning”. The ones who are born in this world will be that he must meet death. And whatever you are building one day, at the end result will be destroyed. And we reached to the limit of what have been described by the Prophet (alaihiswalathu wa salam) from the signs of Judgement Day. From amongst those signs are “Al Malhamathul Kubra/the biggest war, it will take out of five, four, and one will remain and destruction will fill the world from East to West, North to South, it must happen. Then will follow remaining signs…for Judgement Day. And Judgement Day will happen then. It is a must!. It is a must. And warnings and warnings to all human beings for them not to be in a dangerous area. Not to be or live in an area that is dangerous for human beings.It is not necessary that they stay here , they should leave to places and areas where they will be safe, safety. What has happened and what will happen it is because we have reached the limit of this world and Judgement Day is very near. And everyone must “Every soul must taste death” for whatever reason As long as they are still living on the face of the earth, human beings, animals ,plants, they must die at one point. 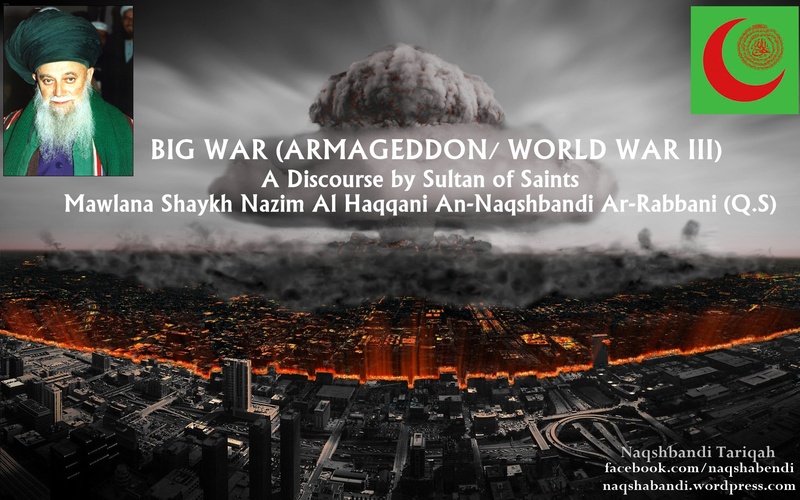 And what we are about to witness from the signs of Judgement Day, the big war which will divide the world in two parts.One part is in safety and the other one is unbelievers. Those who believed in Allah Almighty, they will be saved. Here and hereafter, but the other part that did not pay any attention to the signs of Judgement Day and did not believe in Judgement Day, they will be shameful, harmed, destroyed and will die. With Iman (faith) and Islam (submission to the Divine Laws and traditions of the Prophet Muhammad alaihiswalathu wa salam) we are Your servants, Your servants, all of us are Your Servants Ya Rabbi (Lord our Protector). Be merciful on our weakness Ya Allah. You are the Most Just Judge of all. Subhanak (O Glorified One), Subhanak,Subhanak .Glory to You, Sultan O our Lord , Tawba Ya Rabbi Tawba Ya Rabbi (Grand us Repentance O our Lord), we ask forgiveness to return to You. Tubna lana wa lil akharin., for the sake of generous Prophet (Nabi Muhammad alaihiswalathu wa salam), Ya Rabbi. Irham da-fana irham dunyana , khallisna ya Rabbi and save us O my Lord, amongts us there are innocent infants and elderly and You know about best them. Glory to You Almighty, Fatiha. 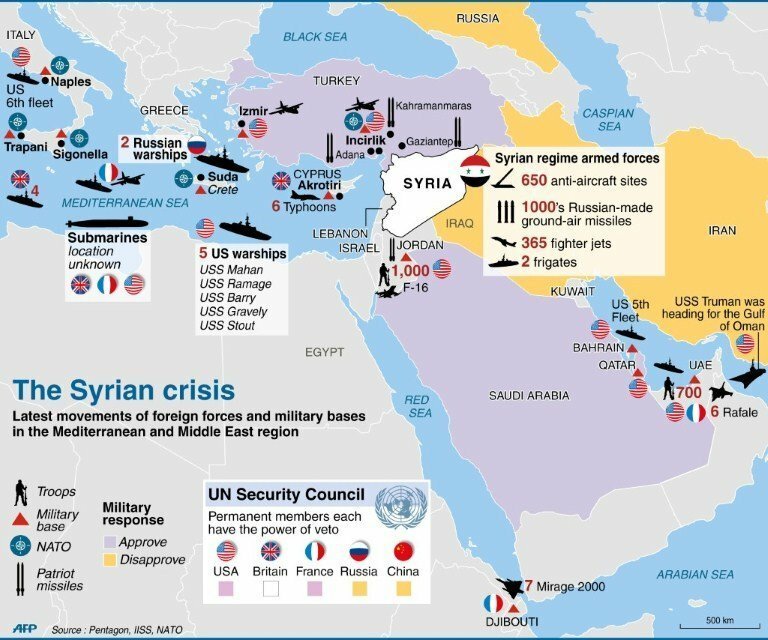 …the power against Russia, US Army will enter Sham (Syria). They divide into three divisions. The first division can’t handle it, so they will run away. Mawlana Shaykh: Yes, from the Muslim army. The second division is martyred. The third division is firm and it destroys the Bani Asfar -Russians. They drive them all the way to Istanbul. Istanbul is conquered with Takbirs. The Sultan comes that time. And, no communism is left in turkey anymore. No matter, how hard you search, you will find none. Sahibu Zaman Hadarath Mahdi (a.s) has his hand in this but he has not appeared yet. I think , Al Malhamathul Kubra (Armageddon) and the taking of Constantinople (Istanbul) happen after six months and the Dajjal (Antichrist) appears. Allah….Allah…Allah..Allah..We are exactly at the right moment for it. Now, there is no chance for it to disappear and peace to come, finish! Now,there will be shooting after shooting. Erdogan went around with these two war ships, didn’t he?. Mawlana: Other than this ship he sailed with, with 2 war ships, ye?. He came to this side, he is looking, with this occasion of oil search, he is looking at the Navy, the starting point of the Russians. Other than this, this (oil research) is not a real reason. Their search hides other reasons. It is empty talk. Allah..Allah ..Allah …Allah…Allah Allah…Allah Allah..Aman Ya Rabbi. Therefore, people need to buy stores of grain for their houses. They need to stock wheat , corn , barley…whatever they can get. You understand?. The situation getting more difficult and it is reaching it’s peak!. It means the time has come, in Muharram (Islamic month),Sahibu Zaman will appear in Muharram. 10th of Muharram. “Fa firru ila Allah (Quran 51:50)”, Run to Allah! You find shelter in Allah’s Divine Protection. There is no other protection,not with guns etc! May Allah not make us lose Iman (Faith), but grant us the security of Iman (Faith). But the world has become so dirty,so dirty…The Unbelief has reached to it’s last point, last limit. Denial , unbelief, dirtiness, ..etc have reached to it’s last limit He will end this.He will finish it. (See: “Allah Will Perish all religions, except Islam-Submission to Him, Ref: Sunan Abu Dawud). He will finish it, Aman Ya Rabbi,,..Aman Ya Rabbi, Tawbah Ya Rabbi…Towba Ya Rabbi (We repent to you our Lord), Towba Astaghfirullah (Accept our repentance and forgive us our Lord). Aman Ya Rabbi….Aman Ya Rabbi…Aman Ya Rabbi…. The Far East (East Asia) etc is not mentioned, but the key position is in he Middle East. It has started here and it ends here. Aman Ya Rabbi…Aman Ya Rabbi….Aman Ya Rabbi…Aman Ya Rabbi…. We seek refuge in Allah,shukr for our situation. The United States will enter Sham, Jordan will enter also. Jordan will go in They will deploy forces. When Russians show up from there, US come from here. Jordan will enter also. Jordan will go in. You understand?. We talk tomorrow , Insha Allah!. We talk tomorrow, if they make me speak. HR: If there is any advice for the people?, is there a way for the people?. Mawlana: The advice to people is they should stay in their homes. They should not go out. They should not go out at night at all. They may keep a well in their house as much as possible for water. They should not rely on electricity. They should cancel everything that work with electricity. Whoever has money in his hand should not keep it as money, but should buy foods ans supplies. The most dangerous areas is ours now. We seek refuge in Allah. I am waiting for 70 years, Allah Almighty makes me wait. Let’s see The instructions will be given to us.This is an arrangement as a beginning, a declaration, Muslims must take care. The people, no shelter can protect them in this wars to come. They will enter the shelter of Islam. None will survive who is not under the Umbrella of Islam. ..finish..finish..One fifth of the people who live in Cyprus will remain. They should know this. Four fifth of them will be taken away, Aman Rabbi. Therefore, students, all of them …should go back to their homelands. This is a declaration. All the students coming to Cyprus from Turkey, they must return to their homelands, immediately leaving schools, everything.Or else, they will be destroyed here. Studying, education etc is not valid anymore….and all these dirty places , they call “university” will be closed. No one will remain.If they stay here, they will be taken away, there is no return. Because from here to Turkey, there is no seaway, because the Russian navy is there. They have their submarines, air forces and they don’t let people pass.Therefore, they should leave from now, immediately. Back to their places,immediately!. Not too many should remain in Istanbul. They should move immediately. Who is from a village to their village, who is from a town, back to his town, who is from a city must go back to his city and may hide in there. They may hide and not go out.And, they may try to return -Run to Allah. Otherwise, finish. Millions of people will be taken away It is the hardest battle. It is the most dangerous war, it is the most terrible war, the one that is to come. The beginning of it is today. Today, is Saturday.Yawmul Ahad (Sunday) tomorrow, there is a movement . There is a movement. Be careful about the management of everything now. People should stock all the necessary things, instead of keeping money, they should keep supply. Because on this Island, the wildness has gone too far. A lot of people will be destroyed. Girls back to their homes, boys back to their places. This now, is the beginning. It is a warning to all Cypriots, to all who live in Cyprus.Greek or Muslim.Aman Ya Rabbi, Fatiha, this is enough. 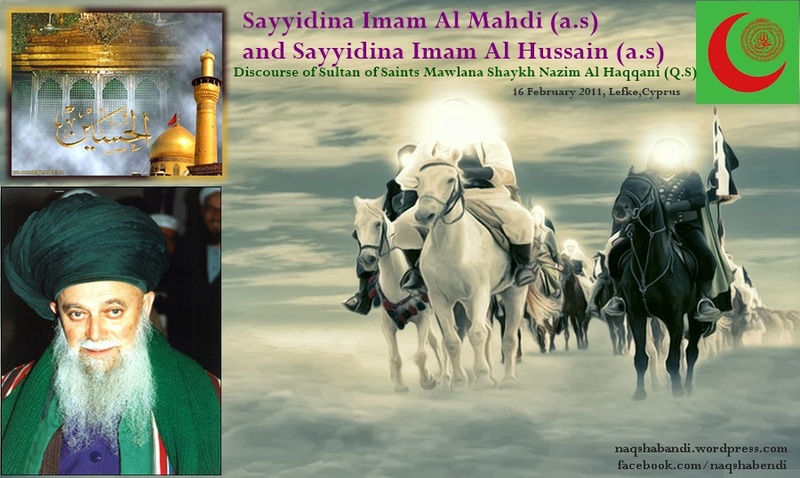 Discourse (Sohbet) of Sultan of Saints Mawlana Shaykh Muhammad Nazim Adil Al Kibirsi Al Haqqani An-Naqshbandi Al-Hassani Ar-Rabbani (Q.S) on 15 December 2012, Lefke,Cyprus. 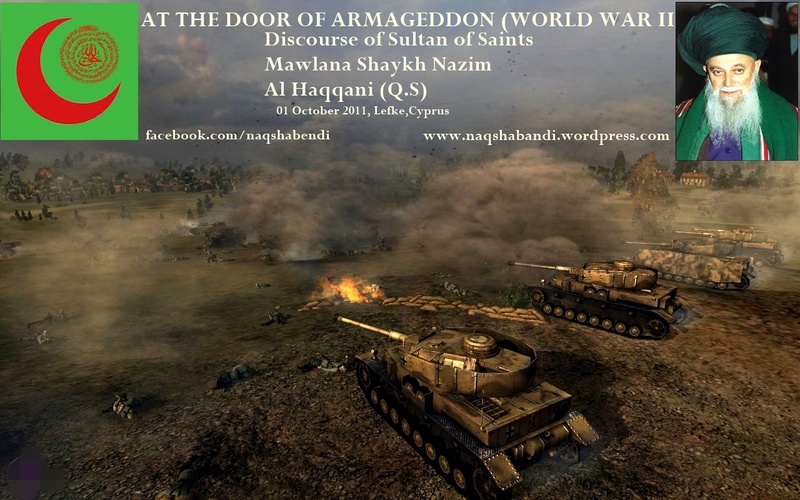 Mawlana Shaykh says that the Armageddon (world war 3) will begin strongly and will start to sweep away through countries. Unbelief and all who are related to unbelief will be swept all or most of them. And Sham (Syria) will open, Insha’a Allah. Mahdi (A.S) gives instructions but he himself is not appearing yet. Grand Shaykh (Sutlanul Awliya Shaykh Abdullah Faiz Dagestani alaihi Rahma) would say: “Then, a power will come from Sham (Syria) to Amuq plain and face the ones coming from up!”. Who he called “the yellows” are the Russians. Who comes from here are the Muslims. They will fight there. 80 8ivisions are on this side, 80 divisions are on the other side.under 80 flags., 12000 soldiers. Calculate 80 times 12000, stand in the upper part. And the same amount of soldiers come from here, from Sham (Syria), they are also 80 divisions. Each division is 12000 men. So approximately 1 million here and 1 million there will fight.It will be finished on the plain of Amuq. I am fearing…I am fearing. This violence, may Allah make us far from it, Sham (Syria) will open like this. The Sultan will definitely come. The Sultan in Jordan will enter inside. Mahdi (A.S)’ hand is on it but he,himself is not apparent yet. When the order comes, when Al Malhama (Big war) is over, Mahdi (A.S) will say 3 Takbeer (Glorification of Alllah Almighty) Allahu Akbar, Allahu Akbar Allahu Akbar. All the technology that is present on the earth now, all of it will stop. No Ships, no flights, not tanks, no cannons,nothing will work. Definitely with swords, the cavalry (horsemen) will arrive and no one know from where they come. When Mahdi (A.S) says the Takbir, finished. It (this information) has arrived. I don’t know what kind of appearances there are in this month, but there will be many appearances…. Ya Rabbi , may a new Islam rise in the month of Rabi’ ul Awwal. O glorious Sultan! step firmly into the stirrup of the horse. There was a mounting stone for the Sultans in Topkapi palace, that the Sultan (Hunkar) would come and mount his horse from there when going to war.They would call him like this: “O glorious Sultan , step firmly into the stirrup of the horse!” He step into it like a lion, draws his sword and says: Ya Allahu Akbar”. The Ottomans will come, they will welcome Mahdi (A.S) and will gird him with a sword in the tomb of Sahabi Sultan Abu Ayyub Al Ansari (R.A). They will deliver the Caliphate and all the holy relics to him, Allahu Akbar.There is an astonishing power now in dunya (in this world). Since it (Safar) began It is all empty talks- they say bashar or shashar …All of them- the chaos in Egypt,all these uprisings, all of them will be cleared. The harmful ones will be finished, and who remains firm is Ahlu Sunnah Wal Jamaat. May Allah make us reach those days for the Honor of His Beloved (Nabi Muhammad Swalla Allahu alaihi wa sallam) Ya Rabbi. Let people carry flags, let them ride horses.I even want to ride a horse,but it is of no use. They made me ride a horse in Brunei- one person would hold me from this side and one person from this side, so that the horse won’t kick me off.So I rode the horse I also have a picture riding the horse. “La Taqum Al Sa’at Hatta Taq’tatila Fi’atan ‘Azimatan, Takunu Baynahum Malhamatun Kubra Da’awahum Wahida.” This is Hadith. “The Judgement Day will not take place till two great powers fight and both their claims are same!”. The world will be two sides and there will be a great battle between them.Both their claims are the same-the United States want to rule the world. Russia says: “No, I will rule”.It is two sides now.The war will take place, it is certain. Our place is safe with the permission of Allah, but I can’t stay here now. There is a move for me but I don’t know yet. Insha Allah, we may make a move because everywhere has become so astonishing. May we reach good days. May the month Safar Al Khair pass by destroying all unbelief. May Rabi Ul Awwal be our festival.This won’t wait until the next month of Safar. That, the heaviness of Safar may be lifted off me. I pray the 2 Raka Safar prayer. Is there a prayer for the month of Safar? They may pray 2 Rakats upto 12 Rakats at Duha time before noon. They may pray at midnight ,may pray before midnight. may pray two thirds of the night passes. Peace and blessings of Allah be upon Prophet Muhammad, his holy family and companions. Mawlana Shaykh Nazim (Q.S) was asked, how can people prepare for the difficulties of the coming days? He said: “Neither money, nor property will save people in these days.Only good deeds,, charity ,and true belief can save them”. It happens according to Allah’s Will. But this is the news from our Prophet (peace be upon him). He has informed us that what it meas by “Banu Asfar” is the Russians. Ibn Arabi Hazret (R.A) said: “Russia will enter Istanbul”.Our Grand Shaykh Hazret (Shaykh Abdullah Faiz Dagestani Q.S) said: “They will stay there three months”.. They will go down to the valley of Amuq (Syria), the Amuq Valley. The battle there is well-known. It is mentioned in the Books. Therefore ,the Russians, they will come, under 80 banners. 80 Flags mean 80 divisions, meaning one million soldiers will come. Another one million will come from the other side. The big battle will take place there. The Muslim army will be in three parts. 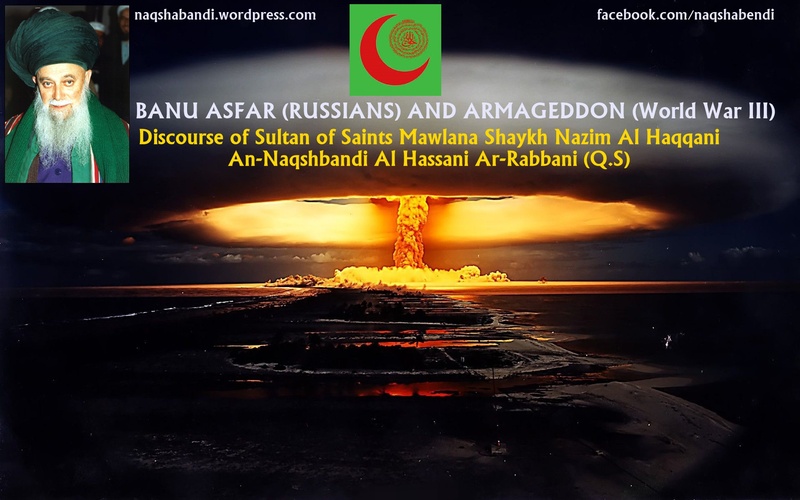 They will come from sham and meet them.It is said, a force from Sham (Syria) will come , to the Amuq valley, that they will meet the Banu Asfar (Russians) in the Amuq Valley.This is the ‘Malhamatul Kubra’,Armageddon. 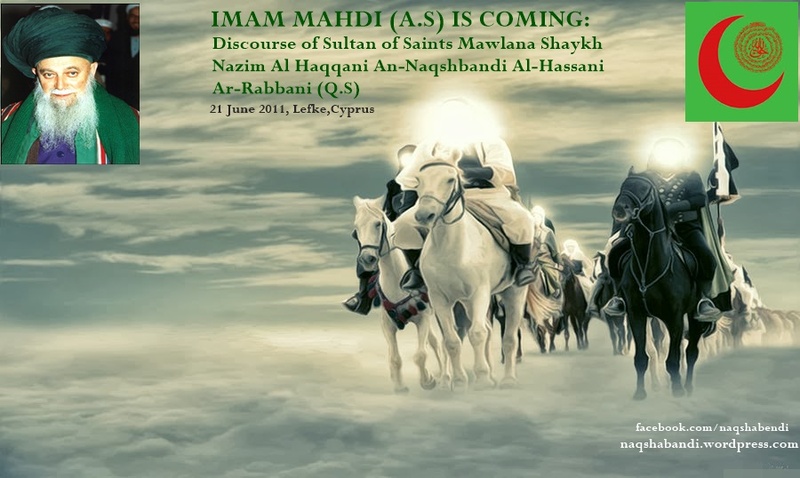 ‘Al Malhamathul Kubra’ (Armageddon) and the conquest of Constantinople (Istanbul) will be after six months and seventh Antichrist (Dajjal) appears’ (Hadith) This is hadith sharif. Russians will come under eighty flags. Under every flag, there are 12,000 men, It is said: Under every flag…meaning each one of them is a division. From the other side comes Muslim army, the forces from Sham. They also come under 80 flags. Mahdi (A.S)’s hand is in it but he has not appeared yet. But it is ‘Mahdi’ (A.S) who manage it with his spiritual power. And, the Muslim army becomes three parts in front of the Banu Asfar (Russians). The first party can’t stand & they run away. Another part, all are martyred. They are ‘Afdal as-Shuhada’ best martyrs. The third part are the ones that they take the revenge. Allah’s divine help reaches to them and they defeat the Russians. They drive the “Banu Asfar” (Russians) all the way to Istanbul. They don’t leave any of them alive in Istanbul. They destroy all the corrupted sects. The Muslim army enters Istanbul Again, it is the Sultan, Sultan will wait for Mahdi (A.S) to say Takbir (Glorification of Allah Almighty) and reach Istanbul, to receive from him the Holy Relics. It will be in this order(procedure). May Allah forgive us. Those difficult, intense days will not be easy. Fatiha (recite Sura Fatiha). Hajjah Ruqya: So Muslims, the Muslim army will be in this Battle? It is not just the US-Russian armies, but the Muslim armies as well?. Mawlana: The Muslim Army will come and United States will support them. American forces will join them. They will also support them. This is explained in Muhyiddin Ibn Arabi Hazret’s (R.A) book in detail. Wa min Allahu Tawfeeq ….Faatiha.